Before the lesson, cut open the heart, so that it can be done without time pressure. Cut it from the tip to the wide top, so that as many chambers of the heart as possible are cut open, and valves can be seen. Fold the halves of the heart back together before class. What makes the blood push through the blood vessels? The heart. Where is your heart? I have a real heart here. What animal do you think it is from? Compare the size of the cow heart with ours (the size of our fist), and relative body sizes that each heart pumps blood through. 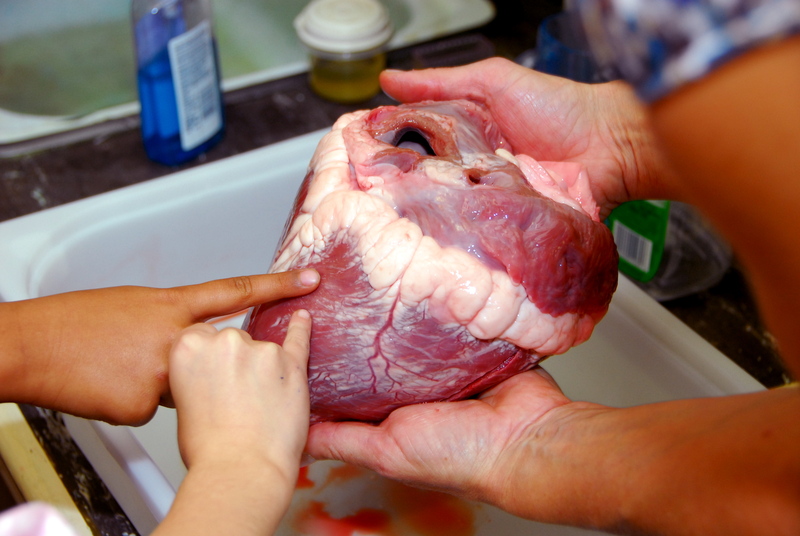 Students should touch the heart so that they know what real heart muscle feels like, and hold it to feel its weight. Wash hands with soap afterwards. 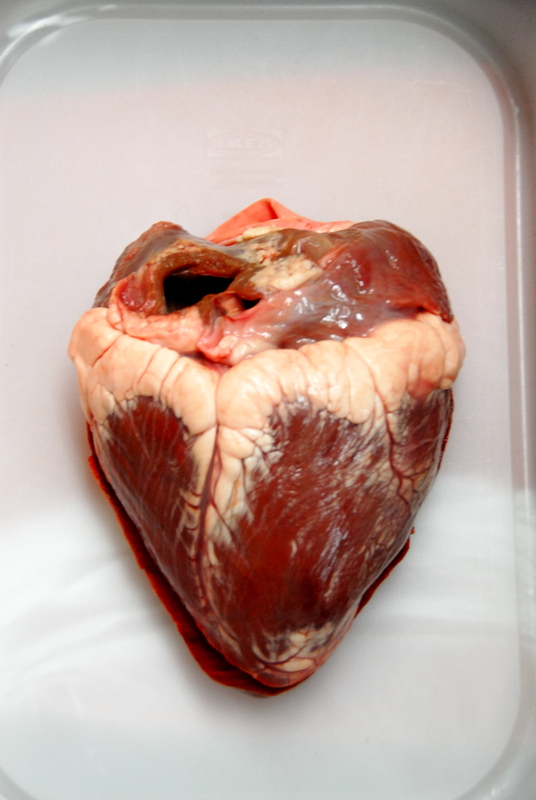 Show features on the outside of the heart: the white fat, branching blood vessels on the surface that bring oxygen to the heart cells, and the large blood vessels protruding from the top of the heart. The tough, thick, white-walled vessels carry blood from the heart to the body (aorta) and lungs (pulmonary artery), and withstand enormous blood pressure. Other vessels bring blood back to the heart (these maybe absent). The left and right ventricles are the largest chambers at the bottom of the heart, with the walls of the left ventricle the thickest, as it pumps blood around the whole body. The smaller chambers at the top (the left and right atrium) are harder to find. They receive blood from the body. Valves between each atrium and ventricle have long tendons holding them in place. Valves just inside the large blood vessels leaving the heart (semilunar valves) prevent blood from flowing back into the ventricles after each heartbeat. From the lungs into the left atrium (vein gone), through the mitral valve (an AV valve) into left ventricle. 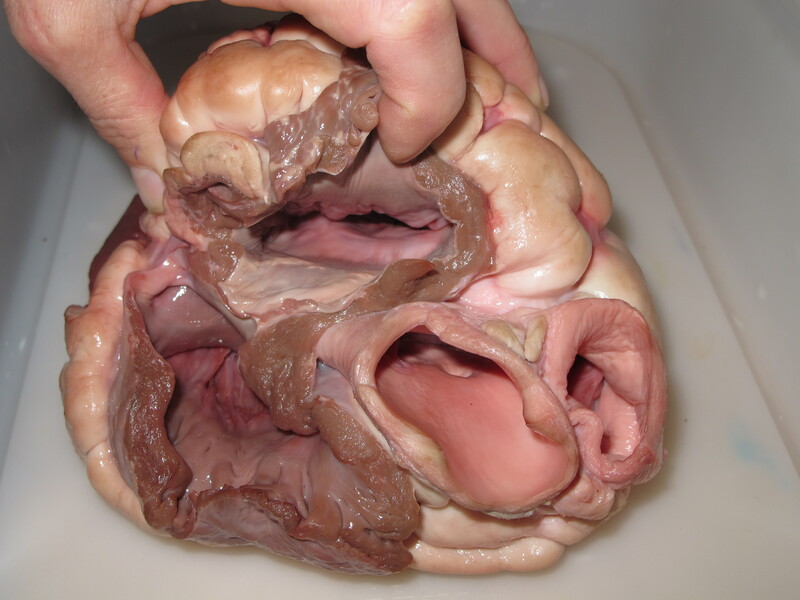 Then through semilunar valve and the aorta to the whole body. Then back from the body through the (missing) vein into the right atrium, through tricuspid valve (other AV valve) into the right ventricle. 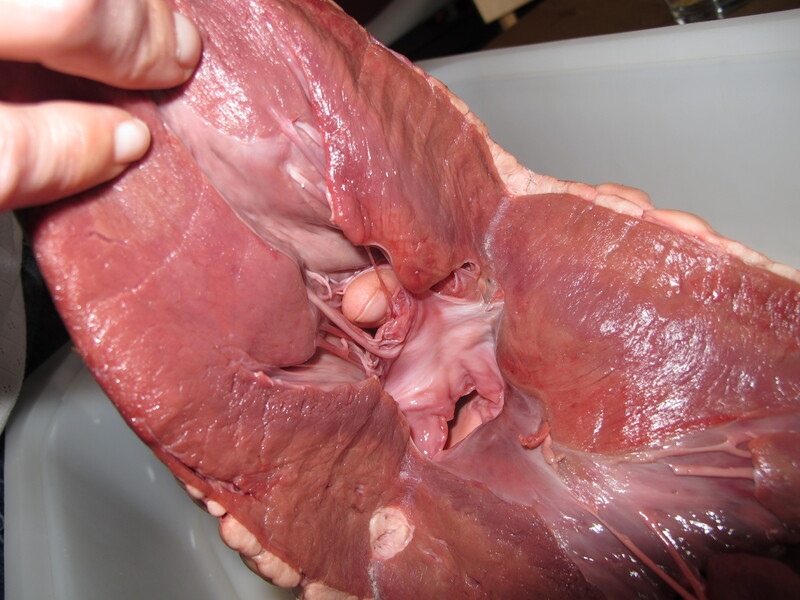 Then through the other semilunar valve through the pulmonary artery to the lungs. 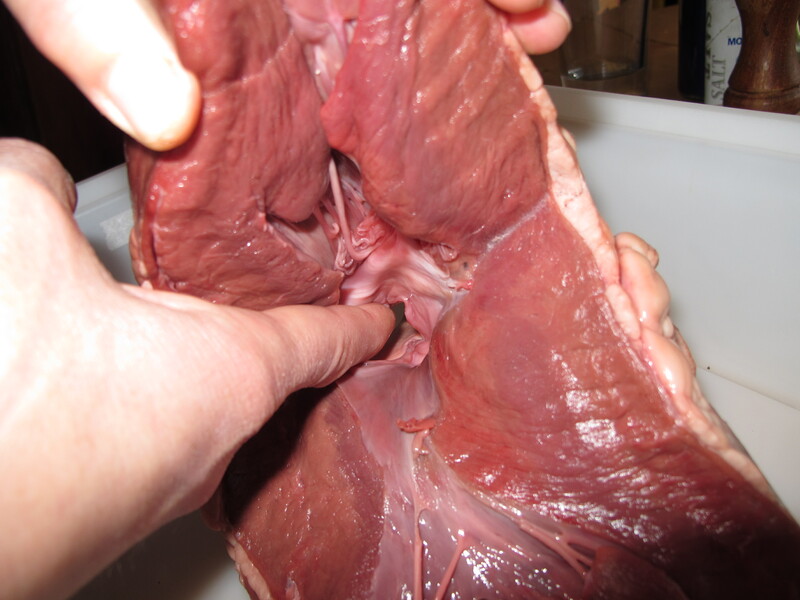 Show large left ventricle muscles, and large aorta leading from it. This chamber pumps blood around the whole body. "Lub" is the AV valves (between atria and ventricles) closing and the rush of liquid behind them. "Dub" is the semilunar valves (between ventricle and artery) closing and the rush of liquid behind them. Students can listen to their neighbour’s heart with an ear on the chest, or with a stethoscope. Your pulse is a the push of blood along the blood vessels with each beat of the heart. Students can feel their pulse in several places, including the side of the neck or on their wrist.